Ignacio Anaya was the maître d' of a popular restaurant in Piedras Negras, Mexico. During WW II, American wives who lived at the Eagle Pass Texas military base would often cross the Rio Grande River to the nearby Mexican town. One day, a group of women stopped at the restaurant for a bite to eat but the chef was nowhere to be found. Ignacio didn't want to turn the women away, so he put on his chef's hat and threw together tortilla chips, cheese, and jalapeno peppers and just like that, nachos were born. The dish got its name from its creator as Ignacio was often called 'Nacho' for short. Nachos gained popularity throughout the next 20 years but really took off when Frank Liberto began selling them at Arlington Stadium (home of baseball's Texas Rangers at the time). Corn Flakes Were Used For Anti "Self-Stimulation"
John Harvey Kellogg was super uncomfortable with bumping uglies - he and his wife never consummated their marriage, they slept in separate beds, and all of their 8 children were adopted. Yet what was even worse than doing it with another person was engaging in self-pleasuring. He thought it was detrimental to physical, emotional, and spiritual well-being. John's solution to all of the "symptoms" of self-stimulation was a healthy diet. He believed meat and certain flavorful/seasoned foods increased intimate desire - so naturally, bland foods (especially cereals and nuts) could decrease or prevent excitement and arousal. John was the director of the Battle Creek Sanitarium which approached treatment in a holistic manner. John's brother, Will Keith Kellogg, came to help him run the books at the sanitarium. There, they were experimenting with shredded wheat cereal and accidentally discovered the process of creating flaked cereal. These Corn Flakes were invented as part of John's health regimen to prevent self-stimulation. Around 1897, the brothers started Sanitas Food Company to produce their whole grain cereals. Will was more interested in the commercial value of this discovery rather than his brother's dietary purity ideas. He worried that the products were too plain and wouldn't sell so he wanted to add sugar to the flakes to make them more pleasant - of course, John wouldn't hear of it. They disagreed over the recipe so much that in 1906 Will left to sell the cereal through his own business he founded called the Battle Creek Toasted Corn Flake Company (which eventually became the Kellogg Company in 1922). Kellogg's Toasted Corn Flakes production began in 1906 and has been on our grocery store shelves ever since. PEZ was invented in 1927 in Vienna, Austria by Eduard Haas III as an alternative to smoking. Originally, the flavor was peppermint, thus PEZ got its name from "pfeffermintz," which is the German word for peppermint. Oscar Uxa's PEZ dispenser design revolutionized the PEZ experience by allowing only one of candies to be dispensed at a time so people weren't touching every piece - this was as a sanitary measure but also doubled to keep smoker's hands busy. The original dispensers (now rare and called "Regulars") had the look of a lighter and people were encouraged to eat a PEZ mint instead of smoking a cigarette. Early slogans were "No smoking, PEZing allowed" and Haas hoped his candy might help lower smoking rates. By 1952 PEZ made their way to the United States but it was difficult to sell the candy because of the strong peppermint flavor. They shifted their target from adults trying to quit smoking to children and created fruity flavored versions with cute character-themed dispensers, which was a hit. The very first character dispensers were a full-body Santa, a robot, and a space gun, but now there are countless designs for the icon candy dispensing devices. Richard Montañez was born in Mexico and grew up in a small town in California picking grapes with his family. He had trouble learning Engish and dropped out of high school because he couldn't understand his teachers. Montañez got a job at the Frito Lay Rancho Cucamonga plant in California as a custodian. 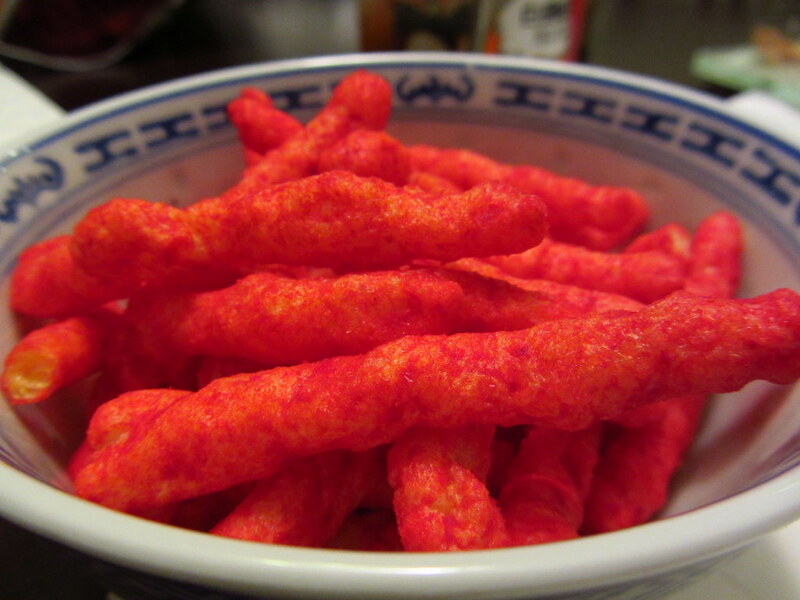 One day when a machine on the assembly line broke and some Cheetos didn't get dusted with the bright orange powder, Montañez took them home to create his own, spicier version of the Cheetos recipe. He was inspired by the Mexican corn on the cob street snack (elote), so he added chili powder among other ingredients to the Cheetos. His family, friends, and co-workers loved his concoction and encouraged him to tell the plant supervisors about it. Montañez talked the secretary into putting his call through to the president of the company where he told him that he had an idea for a new product. He had two weeks to get a presentation ready for company executives. He and his wife went to the public library and copied a marketing strategy out of a business book, he bought his first tie, (which was $3), and he designed sample bags to put the Cheetos in. At the meeting, the executives loved his idea and a Flamin' hot line of products was created. Flamin' Hot Cheetos is the company's top-selling snack and now Montañez is the executive vice president of multicultural sales and community activation for PepsiCo's North American divisions. Fanta was the creation of the German Coca-Cola chief Max Keith (who sported a Hitler-style mustache). Keith had to come up with an alternative after Pearl Harbor ended the flow of Coca-Cola syrup to German bottlers, so he experimented with blending a combination of remnants from liquids like cheese production leftovers, the remains of apples that had been used for cider, and whatever extra fruit he could get from Italy. Then, he sweetened it with saccharin (an artificial sweetener that's about 300-400 times as sweet as sucrose) and named it Fanta, after the German word for fantasy or imagination. Once food became scarce and buyers began using Fanta as a soup base, sales were really good; however, when Coca-Cola (the parent company) reunited with its German branch after the war, it discontinued the soft drink. Pepsi had started introducing different beverage flavors in the 1950s, but (other than Fanta), Coke only ever sold one flavored product - Coca-Cola. In an attempt to even the playing field with Pepsi, Coke revived the Fanta name in 1955 and pushed the new orange recipe across Europe. Soon, it expanded to Africa, Asia, and Latin America while picking up many new flavors along the way. Cotton candy was actually invented during the Renaissance era in Italy during the 15th century. For 300 years cotton candy was only consumed by royalty and aristocracy, but the invention of the cotton candy machine is what made readily available to everyone and turned it into what it is today. In 1897, a dentist by the name of William ironically loved sugar and was a supporter of culinary arts. He had created other inventions in the past but this time, Morrison teamed up with fellow Nashville candy maker John C. Wharton to conceive and co-patent an "electric candy machine" which produced what they called "Fairy Floss." Machine-spun cotton candy was first introduced at the 1904 World's Fair and was a big success - the men put the fairy floss in little wooden boxes and sold 68,655 boxes at 25 cents each (which is equivalent to $6 per box today). Cotton candy melts around your teeth and much like real floss, "fairy floss" gets into tiny nooks and crannies of your teeth causing damage. The sugar gets consumed by the bacteria in your mouth and emits acids that destroy your enamel, but it's doubtful that he invented the machine as a money-making scheme since he was such a sugar lover already. A different dentist, Joseph Lascaux from New Orleans, invented a similar cotton candy machine in 1921. His patented name "cotton candy" grew more popular and the "fairy floss" name faded away pretty much everywhere except Australia. General Antonio López de Santa Anna (who'd slaughtered defenders of the Alamo) was spared his life when he was defeated in San Jacinto. He then went on to a choppy political career where he was President of Mexico for less than a month. In 1869, the 74-year-old Antonio López was living in exile from Mexico and trying to raise money for an army to go back and take Mexico City. To do this, he wanted to sell Mexican chicle (the product of sap from a Central American tree) to America as a substitute for then-expensive rubber. While on a visit to Staten Island, Antonio López was able to sell a decent amount of chicle to Thomas Adams. Adams then went on to try making it into a rubber substitute but unfortunately, he had no luck. However, Adams and his son, Horatio, noticed they could turn the chicle into a chewable product. Adams gave 200 balls of the stuff to drugstores that sold two for a penny and by noon that very same day, they were all gone. Thus began the Adams' gum dynasty. 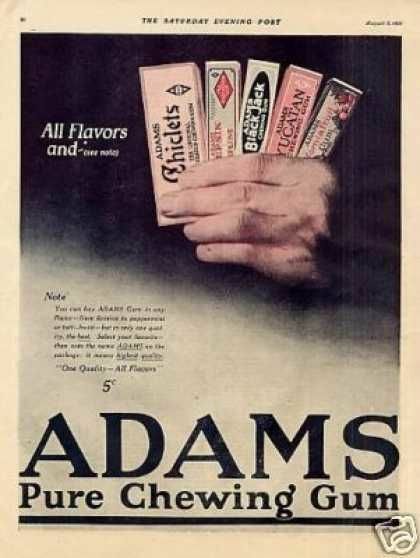 Antonio López died penniless and Adams died rich after going on to create Adams Clove Gum, Chiclets, Blackjack, and more. The heat and humidity of the Florida swamps were taking its toll on the University of Florida football players at home games. The Gators were getting dehydrated and not performing well, so researchers at the university formulated a drink in 1965 to try to help the struggling team. The new beverage helped counteract the dehydration way better than pure water and the Gators became an effective second-half team. The University of Florida researchers initially considered naming their product "Gator-Aid" but settled on "Gatorade." In 1967, Gatorade helped fuel the Gators' first Orange Bowl win. After one of its developers at University of Florida moved to Indiana in 1967, he met a vice-president for Stokely-Van Camp, a national company which produces canned and frozen fruits and vegetables. Stokely-Van Camp secured the rights to Gatorade from the university and its researchers and then marketed the drink nationwide. In 1983, Quaker Oats bought out Stokely-Van Camp and then in 2001, Gatorade became a member of the Pepsico family when Quaker Oats merged with them. Today's Gatorade is a sweet-tasting drink that is still a combination of carbohydrates (sucrose, glucose, and fructose) and electrolytes (potassium and sodium), but luckily, the drink has changed little since its creation. It's reported that the first batch the scientists made was far from tasty, but the addition of lemon juice made it drinkable. A few months after Disneyland opened in 1955, Frito founder, Charles Elmer Doolin, convinced Walt Disney to let him open Casa de Fritos (now Rancho Del Zocalo), a Tex-Mex restaurant in Frontierland. Part of the deal was that with every purchase came a complimentary bag of Fritos. Frito Co. didn't make the tortillas or taco shells at Casa de Fritos though, instead, that was contracted to Alex Foods Co. whose factory was about 10 minutes up the street from Disneyland. One day in the early 1960s, one of the route salesmen saw pieces of fried tortillas discarded and told the cook to make them into tortilla chips instead of just tossing them in the trash. The restaurant cut up and fried the surplus tortillas and added basic seasoning. The snack was such a hit with guests that Casa de Fritos put them on the menu - without the knowledge of the Frito Co. since tortilla chips weren't part of the Frito family at that point. About a year later, Arch West, marketing vice president for the new Frito-Lay Co. (the result of a merger between Fritos and H.W. Lay & Co. in 1961) passed by Casa de Fritos and noticed customers eating the chips and how popular they were. West presented his bosses with a plan to market tortilla chips for national release. Frito-Lay made a deal with the Morales family, founders of Alex Foods, and bought all the equipment they needed to mass-produce the chips. Doritos ("little golden things") was given its name and the snack debuted in 1966 to immediate sales. Alex Foods (now known as Don Miguel Mexican Foods) produced the chips for a short time regionally, before it was overwhelmed by the volume, and Frito-Lay moved the production in-house to its Tulsa plant. In 1905, eleven-year-old Frank Epperson had a cup filled with water and powdered soda. He ended up leaving it outside on his San Francisco porch. That night, the temperature dropped below freezing and the next morning he discovered that the drink solidified around the stirring stick that was still in it, thus creating the first summer staple. 17 years later, Epperson debuted the treat at a fireman's ball which turned out to be a sensation, One year later he was selling his frozen pop at an amusement park in Alameda, California. By 1924, Epperson had a patent for his frozen concoction which he called "the Epsicle ice pop." His kids called the treat Pop's 'sicle and convinced him to change the name from Epsicle to Popsicle. Originally, they were available in seven flavors and marketed as a "frozen drink on a stick." In 1925, Epperson sold the rights to the Popsicle to the Joe Lowe Company of New York and popsicles were distributed around the country. The origin of pretzels is a little mysterious, but there are numerous claims that pretzels were invented by an Italian monk who baked strips of dough and folded them into the shape resembling a child crossing its arms in prayer. They would give these "pretiolas" or "little rewards" as treats to children who had memorized their prayers. In 1440, Catherine of Cleves used a prayer book that had a picture of St. Bartholomew surrounded by pretzels and by this time, pretzels were considered a sign of good luck and spiritual wholeness. This is mostly because the three holes are said to represent the Holy Trinity. Pretzels spread its "good luck" connotation to other holidays like New Year's Day in Germany where children hung pretzels around their necks. Also, pretzels were hung on Christmas trees in Austria in the 16th century, and parents hid pretzels on Easter for children to find like how eggs are hidden now. 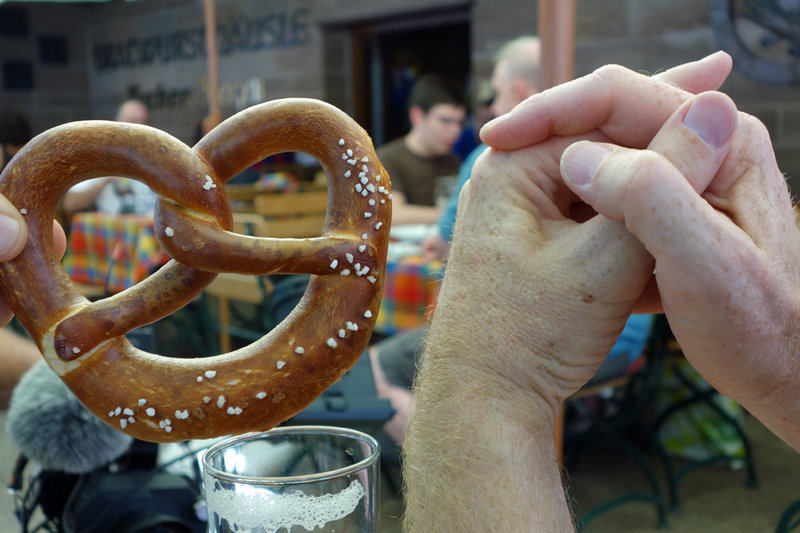 Moreover, Germans in the 16th century made it a tradition to eat pretzels on Good Friday. In fact, the religious ties were so deep with this salty treat that pretzels were once considered the "official food of Lent" by Catholics. In the 1950s, Arnold Greenberg was running his father's store in New York where they sold staples like lox, herring, and homemade pickles. But by the 1960s, his mostly Jewish neighborhood was turning more hippie so Greenberg converted the business into a health food store. He then joined forces with his childhood friend, Leonard Marsh, and Hyman Golden, who was married to Marsh's sister, and the three of them took on a part-time venture to supply fruit juices to health food stores. In the late '70s, the three men had the idea to produce a soft drink flavored only with natural juice. Their company (Unadulterated Food Products) named the carbonated apple juice Snapple, a mix of "snappy" and "apple." Unfortunately, one of the batches of apple juice fermented in the bottles, which sent the caps blasting off. Despite this mishap, the drink's name was so expressive that the company changed its name from Unadulterated Food Products to Snapple and the original juice is now called Snapple Apple.